Dry cleaning has been around for a while, but it has evolved over the years to be a safer, more eco-friendly service. Like many other modern-day solutions that we incorporate into our everyday lives – sewers, government-maintained roadways, our calendar – dry cleaning was an invention largely attributed to the Roman Empire. Dry cleaning is a method of removing stains and preserving fabrics that doesn’t require a water-based solution, and Romans perfected the first type of dry cleaning when they realized that a specific type of clay was perfect for removing oil and grease from white fabric. Without this realization, imagine how many toga parties would have been ruined! What we consider modern day dry cleaning, and the direct ancestor of the methods we use at our many Mulberrys dry cleaning locations, was actually an accident, if the story is to be believed. They say that in the 1840s, a French maidservant accidentally knocked over a kerosene lamp, which covered a badly stained linen tablecloth with lamp oil. While she was no doubt fired for her clumsiness, her master, the textile maker Jean-Baptiste Jolly, found that everywhere the oil touched, the stained linen became cleaner. It was this accident that led Jolly to opening what is considered the first dry cleaning business in the world: Paris’ Jolly-Belin. They used kerosene as their cleaning agent, and other gasoline-based products, all the way until the end of the 19th century. In the 1920s, American dry cleaners began experimenting with other chemicals to use in their dry cleaning businesses. Chlorine-based solutions were the most popular, but it was Michael Faraday’s discovery of a cleaning chemical known as “perc” that really became what we would now consider modern dry cleaning solutions. This discovery was made in 1939, and was largely due to the major shortages in petroleum due to World War II. Like many other industries, the dry cleaning business had to deal with the world-wide effects of the war. 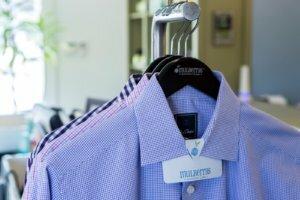 The goal of dry cleaning was then, as it is now, to clean delicate fabrics and to preserve their color; by experimenting with new chemicals in the face of shortages, these dry cleaners paved the way for the services you can purchase in and around Minneapolis from Mulberrys Garment Care today. In the 1990s, many states began making regulations that would limit the use of “perc” due to the emissions that it can cause. California was one of the early adopters of these regulations, though as of 2011, nearly 90% of dry cleaners across the country still use perc. Due to the clear evidence that perc is not a safe product for long-term use, Mulberrys cleaners in Minneapolis, St. Paul, Eagan, St. Louis Park, and Edina do not use it, choosing safer and more environmentally friendly options. By today’s standards, dry cleaning is defined by the FTC as a service that uses special machines and solvents that are not available to the public to clean garments and fabric; that use up to 75% humidity in the treatment of fabrics; that use tumble dry methods that include heat up to 160 degrees; and that use steam to press or finish fabrics for better preservation. Most dry cleaners across the country are still using these guidelines and techniques that have withstood the test of time since World War II and before. Like so many other inventions throughout history, what started as a happy accident has become a vital service that we utilize in our daily lives today. Thanks to innovative Americans who had to find new methods in the face of hard times, we can now ensure that all your precious items, as well as your business attire and wardrobe, are in perfect condition.